Yummy yummy, First quarter’s wrap : January – March 2014 – so parislux ! I just got this idea, from the wandering cows. Nice to do a monthly wrap and remember or review post. I though I’d do a quarter’s wrap! Love the word wrap… It’s yummy. Help yourself, in a piece of my world. Don’t let her French writing scares you, she shares in each post nice music and great images! Here’s a picture of the mountain wolf, one of the beautiful and sweet dog of the Chalet Etoile de plan Maison Cervinia Italy. Would then be a Mountain dog. 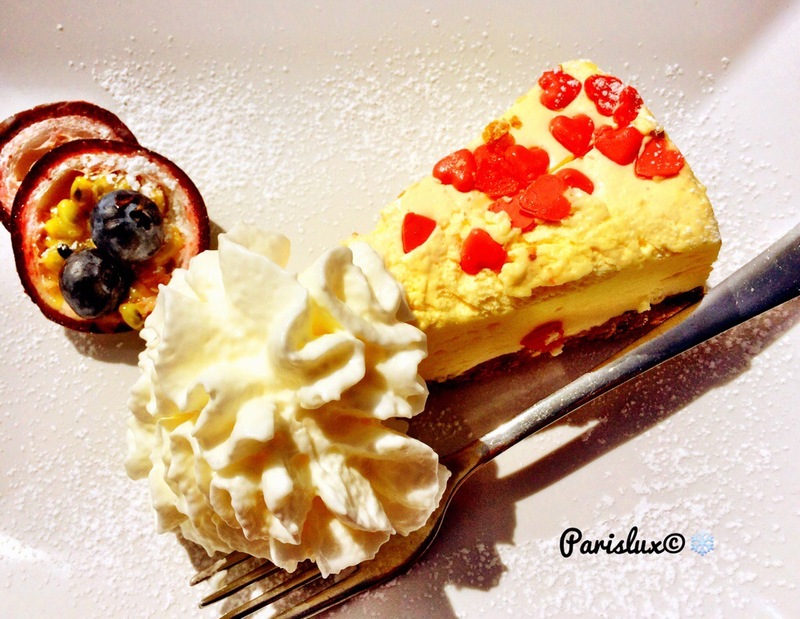 The passion cheese cake* in the above picture was also served in the Chalet Etoile. Miam Miam ( yummy yummy in French). Picture taken by my “Torn”, husband, for Parislux, my phone was too far away…. Thanks for following me, coming by, and feel free to pass by anytime, you are more than welcome. Jessica alias Hopeje, always looking forward and wishing for the best to come. Previous Previous post: Find magic !